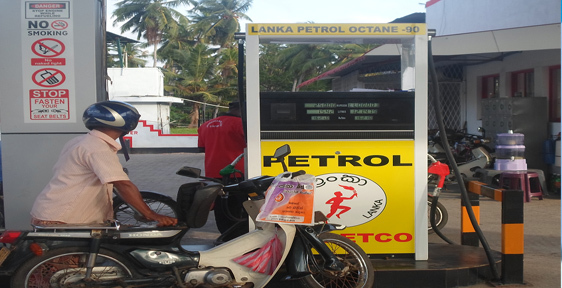 Sri Lanka's ministry of finance this week raised the price of fuel from midnight on February 11. The price of petrol increased by Rs 6 per litre, auto diesel by Rs 4 and super diesel by Rs 8. "Under the Fuel Price Formula diesel price should have been raised by 9.59 rupees, but the government raised the price by Rs. 4 not to affect the public and the transport sector," the ministry said in a statement. The rising cost of living remains a key issue on the island, which was used by the former president, Mahinda Rajapaksa to garner support for his come back to politics. Following his temporary appointment as prime minister, Rajapaksa swiftly cut the price of fuel in a bid to win over Southern voters. "Given the impact of fuel pricing on all strata of the society especially those engaged in transport, agriculture and fisheries sectors, price of Petrol (Octane 92) will be reduced by Rs. 10 per litre, Auto Diesel by Rs.7 per litre and Lubricants including the 2T lubricants used in three-wheelers and small agricultural engines by Rs.10 per litre with effect from mid night today.At the same time a cost-based pricing mechanism will be implemented on fuel in place of the monthly fuel price formula," Rajapaksa said at the time.